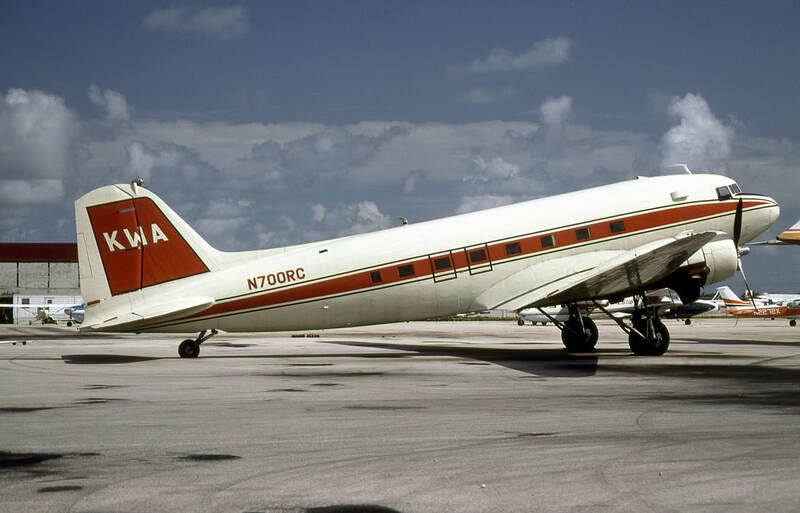 During 1980 and 1981, Key West Airlines operated DC-3 flights between Key West, Miami and Ft. Lauderdale. In 1982 the owner of the airline was convicted on conspiring to import marijuana from Jamaica to Brevard County in May 1980. Douglas DC-3 N700RC (msn 11628), formerly of Red Carpet Airlines is pictured at Fort Lauderdale on October 21, 1982. The 1981 edition of JP Airline Fleets shows N700RC as the company's sole aircraft. This photo is courtesy of Paul Thallon. The November 15, 1980 issue of the Official Airline Guide shows four Miami - Key West round-trips effective December 1 and three Miami - Ft. Lauderdale round-trips effective December 15. This map was created with the Great Circle Mapper, copyright Karl L. Swartz.